Is there life after summer in the mountains? Of course there is! What about when you have a baby or toddler? Still yes! It's just more complicated and requires some special preparation. This is article two in the series and will address the topic of shoulder season activities in the great outdoors. The name "shoulder season" refers to those months before and after the main tourist season. There aren't any more flowers in the meadows or leaves on the trees, snow might have started to fall or be lingering in the spring months, but there isn't enough snow to play in it. I believe in making the most of every season and think that there are some real advantages to hiking during the off season. This article will outline some of those advantages and give practical trail suggestions to help you enjoy the next couple months as well as return to hiking next spring. This is your chance to hike all those popular trails that were crawling with tourists all summer long. You know which ones I'm talking about; Johnston Canyon, anything around Lake Louise, anything with a tea house, or any trail accessed by a gondola. Summer vacation is over and the trails are quiet. You can get family photos without cropping the tourists out. You can sit down in a meadow and enjoy a peaceful picnic lunch. One of the main reasons we go to the mountains is to get away from the city. This is the one time of year you will actually feel like yes, you have escaped the crowds and left the city truly behind. You don't need flowers, sunshine, leaves on the trees or green grass to enjoy a canyon. It's the perfect way to spend a cool November day. Some canyons are even better at this time of year because the water is frozen and you can walk right through the canyon instead of skirting around the edge on the hiking trail. You will want to wear bright colours if you are taking photos to contrast against the gray canyon walls. Our favorite canyon hikes are Grotto Canyon, Heart Creek and Jura Canyon, all in Kananaskis. Grotto Canyon and Heart Creek always allow you to hike in the canyon itself but for Jura you normally have to follow a hiking trail above the narrow fun sections. Go in late November though and you'll be able to walk right through the canyon on the ice. Wear ice cleats if you plan to hike through the canyon. It can get slippery. If the water isn't quite frozen you'll need good balance to walk across the odd log, good water-proof boots, and a bit of courage to make it through. We love Jura so much that we make it an annual trip every year in late fall. These areas will see less snow in shoulder season and you'll have the advantage of viewing the surrounding mountains covered in snow; something you don't get to see in summer on the same hikes. Many hikes are in fact more beautiful during shoulder season because of these snowy views. Mountains that are normally gray and unimpressive take on a whole different beauty when covered in snow. Special hike worth mentioning - the Upper Kananaskis Lake Circuit or at least a portion of it towards the Point Campground on the North side, though outside the front ranges, is an amazing shoulder season hike. The mountains surrounding the lake are breath taking when snow covered. It's a photographer's paradise. Continue past the campground a short distance for a lovely set of waterfalls as well. Highway 66 (Powderface Trail) and Highway 546 through the Sheep River Area are closed from Dec. 1st through May 14th each year. Hikes affected above have a * before their name. For Prairie Mt., the Sulphur Springs/River view loop, and the Foran Grade loop you will be parking right at the winter gate. If you are anything like me, it's often hard to slow down in the middle of summer because there is so much to see. Flowers and alpine meadows wait to be explored and usually aren't located within steps of the parking lot. You have to hike for at least an hour to reach those glorious meadows unless you are hiking Ptarmigan Cirque or have taken the bus up to Sunshine Meadows. Come shoulder season though, it's enough to just be outside! There's no pressure. I'm ok with stopping to look at each branch or leaf, to throw stones into the river, and to allow my toddler to ramble at his own pace. I know I should be ok with that all year, but it is a challenge for me that I'm working on. Next summer when my massive 39lb two year old is too heavy for his Little Life child carrier, I'll have to work harder on enjoying his pace. Now that all the international tourists have gone home, why not enjoy the sites that make our National Parks famous. Shoulder season is the perfect time to visit the Banff hotsprings, take a ride up the gondola, visit Sunshine Meadows before the shuttle bus closes for the season (it runs until the first weekend in October), or take in the sites at Lake Louise. Canmore and Kananaskis Village also offer many opportunities for a nice day away from the city. Canmore: Take a walk along the river on a mixture of paved and gravel trails. Playgrounds abound along the trails and the views towards the 3 Sisters are beautiful when snow covered. You might even find room on a patio in shoulder season if it's a nice warm day. Kananaskis Village: Take a walk along the Village Rim Trail for beautiful views, visit the playground, have an ice-cream cone, sit by the big fireplace in the Delta Kananaskis Hotel and enjoy a coffee, or if you have lots of energy, talk a walk along the ski trails that connect the Village to Ribbon Creek below. They are all chariot friendly. One of the trails is even paved from the Village down to the creek making for a great bike ride or easier walk with a stroller. This is the perfect outing all year round. In winter there is a skating rink and tobaggan hill. There are many beginner ski trails. It's easy to go to the Village for the day and pretend you are staying there in decadent luxury. Banff: Of course there's the hotsprings and the gondola along with the hikes already mentioned in this article. Beyond that try taking a drive down the Vermillion Lakes road for incredible scenery. The paved road is quiet and perfect for a bike ride or chariot hike. Do the Lake Minnewanka driving loop with stops for picnics and walks. Then of course, it's always fun to just explore the shops in Banff or take a walk along the river following East or West Central Park. Shoulder season is a great time to explore National Parks further away. Our favorite park is Jasper. It gets very busy in the summer but by October you will have the town to yourself and will barely see a soul on the hiking trails. We love the 3.5 km Old Fort Point Loop near the town of Jasper. There are also great walking paths around many of the local lakes. Our favorite short trails in Jasper are Lac Beauvert at the Jasper Park Lodge (very worthwhile to check out even if you can't afford to stay or eat here) and Pyramid Lake where you get to cross a beautful bridge to a small island. The sky tram though expensive takes you high up Whistler's Mountain from where it's a short hike to the summit. It's a highlight for most children and a hike they often remember through out their lives. Finally don't miss taking a drive out to Maligne Lake. The lakeside trail is beautiful and perfect for small kids who'll want to spend an hour throwing stones into the lake. You can also stop at Maligne Canyon, Jasper's version of Banff's Johnston Canyon. Miette Hotsprings are a drive outside Jasper up a long twisty mountain road but if they are open, they are well worth a visit as they are the hottest springs in the National Parks and you will have almost guaranteed wild life sightings. They are open from early May through mid October each year. Another place we love in shoulder season is Kootenay National Park and the Columbia Valley. Our family goes to Radium Hotsprings for at least two or three weekends every year. There are many affordable condos for rent and it makes for a lovely family vacation close to home. You won't spend much time in the National Park itself because the town of Radium is just outside the park boundary. 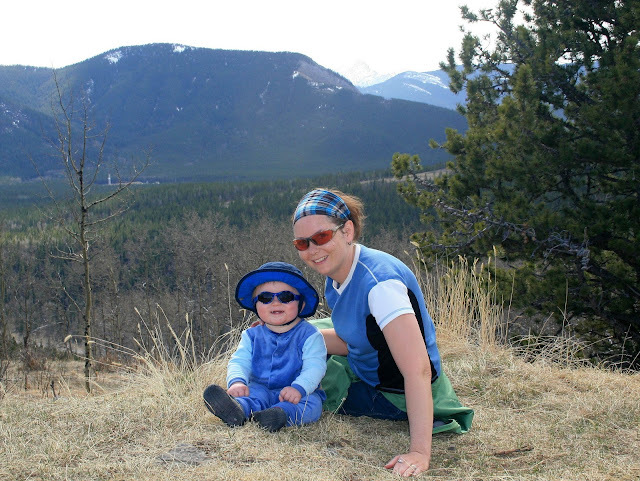 When we go to Radium, we spend a lot of time exploring the Columbia Valley and the towns of Fairmont and Invermere. Fairmont has its own hotsprings and resort (another amazing family place to stay for a weekend).